For more information about reporting see the Reporting in detail tour section. Also known as "Pull Printing", Find Me printing enables users to print to a single virtual global queue. They can then walk up, log on to any Papercut managed device and have their print job printed on the spot. The Samsung MFD solution is developed by the PaperCut Software development team. 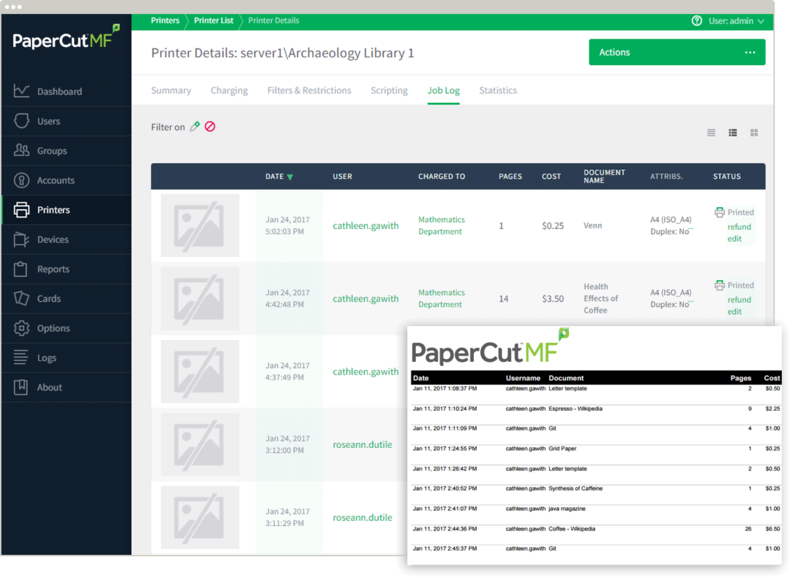 This means that the copier interface is consistent with the other PaperCut user interface; users only have to learn one system and one set of terminology. PaperCut MF is a single solution where print and copier control are all managed in the one system. Users have a single account and administrators have the same level of reporting and administration for all services. The Samsung MFD solution is developed in-house by the PaperCut Software development team. This ensures consistency in all areas of the application. All MFD solutions communicate with the PaperCut server whether it be running on Windows, Windows Cluster, Linux, Novell or Mac Server. Many of PaperCut's customers have stringent security requirmenets (accurate billing, conficentially etc). All MFD solutions are designed to support security needs. If security issues are discoverd then any deficiencies are fully disclosed until a fix is supplied.